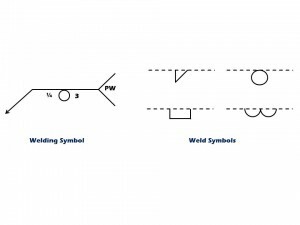 Judy talked to you on Wednesday about five of the most common mistakes made when reading welding symbols. You’d think that would cover it all, right? Wrong. I’m here to tell you that we have more, five more in fact. (I bear great news, don’t I?) As Judy mentioned, trying to decipher AWS 2.4 initially came to us as a feat comparable to decoding ancient Egyptian hieroglyphs. From the outside looking in, these symbols were merely circles, triangles, and rectangles idly sitting on a line that pointed to what seemed to be the letter “T”. Puzzling indeed. Slowly, and I mean slowly, these geometric shapes and th at letter “T” came to mean more, and now that we have made welding symbols more accessible, we know it will be clearer to others as well. You’ve seen Judy’s starting lineup of mistakes; now let’s take a look at the next string. While these two words sound the same, they imply very different things. A welding symbol is the entire image as it appears on a plan. It includes information such as a reference line, an arrow, weld dimensions, notes, as well as the weld symbol. 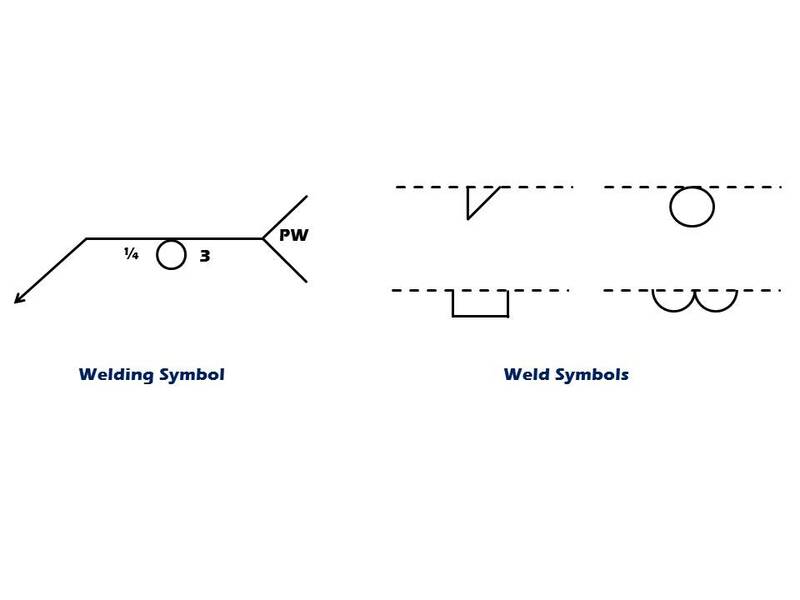 A weld symbol is a single element that is part of a welding symbol. It indicates what type of weld is to be applied to the joint. Think about it this way, a welding symbol is made up of weld symbols, but a weld symbol is not made up of welding symbols. To indicate that a specific weld process is to be used, an abbreviation is placed within the tail of a welding symbol. For example, the abbreviation for electron beam welding is EBW and the abbreviation for gas tungsten arc welding is GTAW. 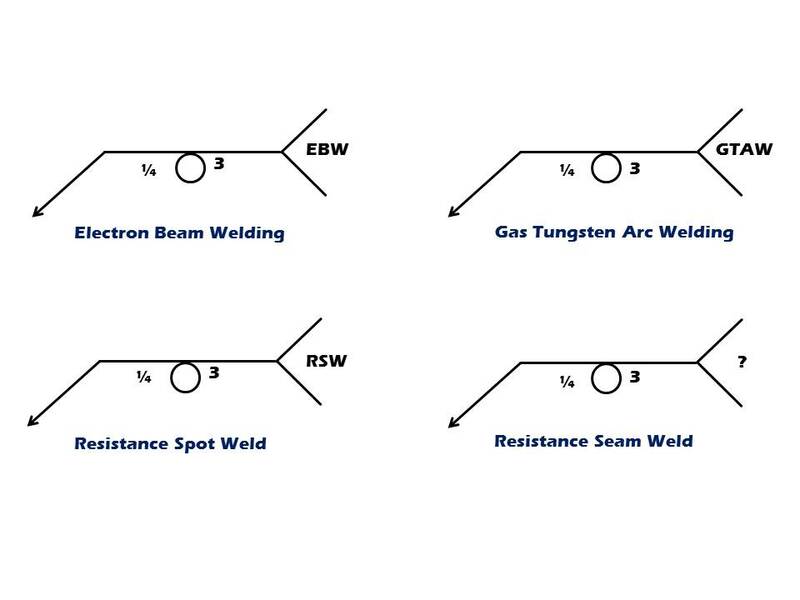 So, naturally, the abbreviation for resistance spot weld is RSW, right? 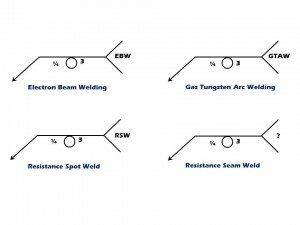 If this is so, then what is the abbreviation for resistance seam weld? These assumptions can land you in hot water, so if there is any confusion, always consult a list of abbreviations. 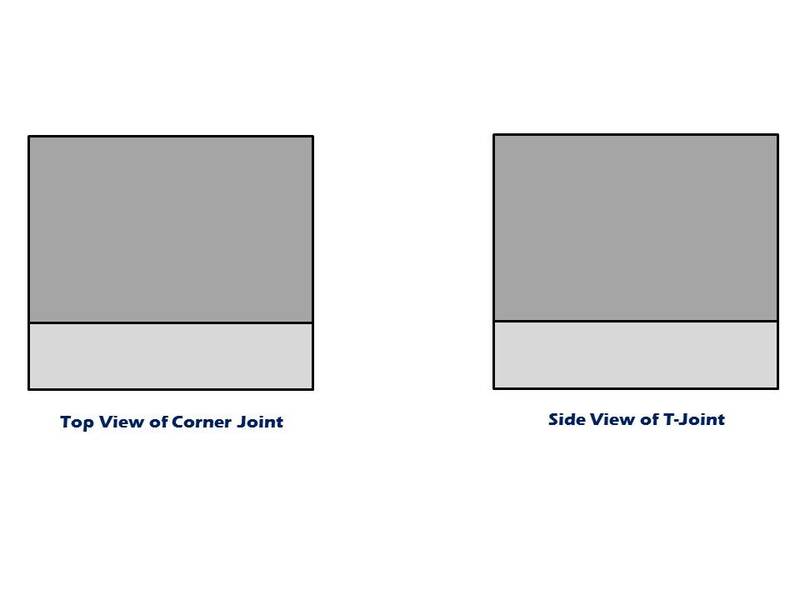 This first image shown here is the top view of a corner joint. 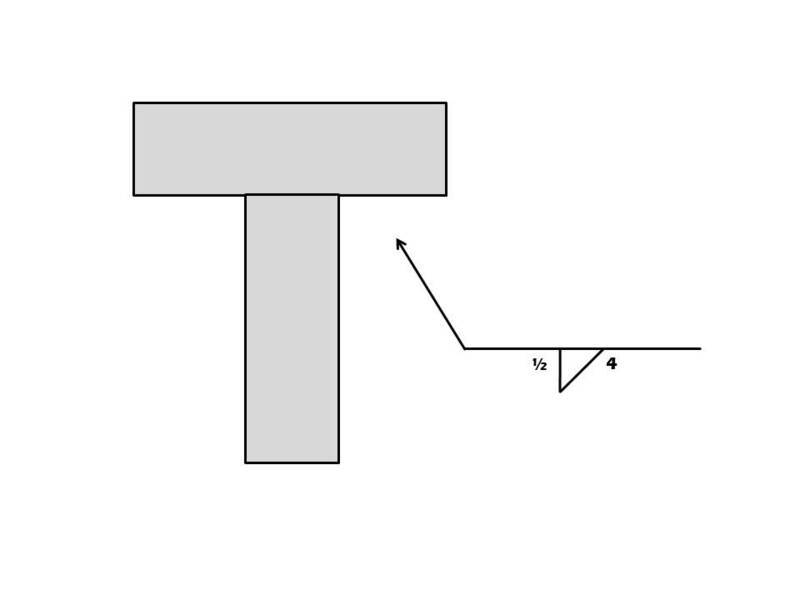 The second image shows the side view of a T-Joint. Notice any resemblance? That’s because these two images are exactly the same. 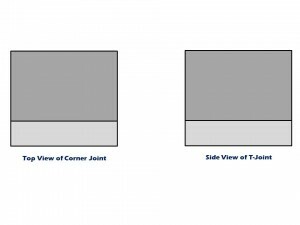 If there is ever any doubt, look for another view of the joint on the plans or ask a supervisor in order to be absolutely certain before welding. These are tricky. A fillet weld with unequal legs has two separate leg sizes. This can be communicated on a welding symbol using two different methods. The first is by using dimension lines. The area that is encompassed by the dimension lines, receives the dimension indicated next to it, not the member that the dimension line touches. This can also be indicated by using a note written within the tail. Both of these indications also tell us, not only which dimension applies to a specific member, but which dimension applies to the other as well. On a plan, only one dimension needs to be indicated in the drawing in order to assign a leg size to a particular member. As long as you know where one dimension goes, the other dimension applies to the remaining leg by default. There are a few weld types that use the same weld symbol, such as plug and slot welds and spot and projection welds. When reading these symbols, there are a few ways to differentiate between the two. Let’s look at plug and slot welds. With plug welds, the diameter symbol is used to indicate plug weld size since plug welds are round. Slot welds, however, are elongated. They are dimensioned by width and length, a dimension which plug welds do not have. If there is a diameter symbol, then it’s a plug weld. If there is no diameter symbol, then it’s a slot weld. It’s as simple as that. 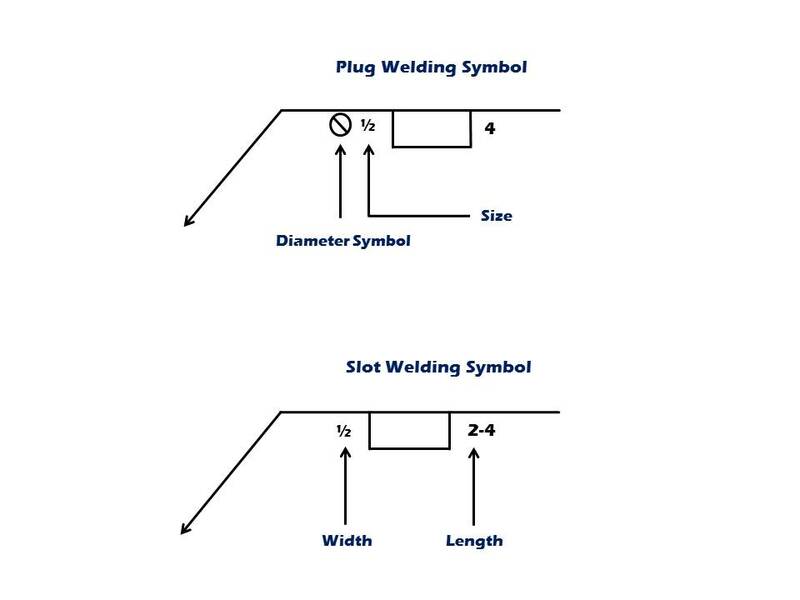 To get better acquainted with these rules or for more information, check out our latest course: Understanding Welding Symbols, scheduled for publication on March 28th. 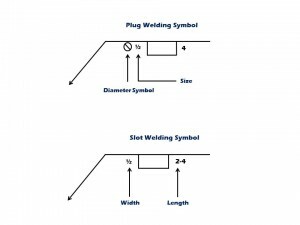 Within this course, we cover all the mistakes discussed in this blog in addition to the rules that apply to all of the other welding symbols. The course starts with very basic concepts including the five joint types and how they look on a plan, and then it walks you through the more in depth concepts such as, what to do when a fillet weld has uneven legs or how to communicate which weld process is to be used on a joint. From the outside, AWS 2.4 seems like a rather unassuming book of standards, but let me tell you, that little book packs in pounds and pounds of encrypted information within a very thin spine; information needed in order to make the big leap forward to becoming a CWI. With Understanding Welding Symbols, we help to lighten that load so that you can strut a little more confidently toward your goals. Thanks for sharing, It’s very informative and it helps me a lot in training my trainees. been welding 38 years goes to show you are never to old to learn! thank you for this info. it will helps so many welders and trainor. Re. plug welds and your comment above about using a diameter symbol, nowhere in AWS A2.4-79 does it say that a diameter symbol is required to show the diameter of a plug weld. Whether it is a round plug weld or a slotted profile weld is determined by whether or not there’s a length dimension given, if there is no length then t’s a round plug weld. Fig. 17 of the above standard shows how to call up plug welds of both round plug welds and slotted plug welds. The document I reference may be old (none of us are as young as we used to be!) but I’ve not seen any newer document showing a dia symbol maybe you can point me in that direction? Hi, I guess I have to eat my words! I managed to lay my hands on AWS A2.4:2012 and now it does show a diameter symbol in front of the plug weld size. Who says you can’t teach old dogs new tricks! Question 1 What does the following weld symbol or letters G.O.S.L mean? Question 2 What does the letter symbol LLOS also mean ? I have been welding and fitting for almost 30 yr and these 2 letter symbols are i guess new to me so your help would be so greatful cause it is bothering the crud out of me . In an unequal leg length,say 3/8″x5/8″ is the first dementsion the vertical leg & the second the horizional leg?What is the standard aws specification? Hello! Thank you for submitting your question. I’d be happy to clarify for you. 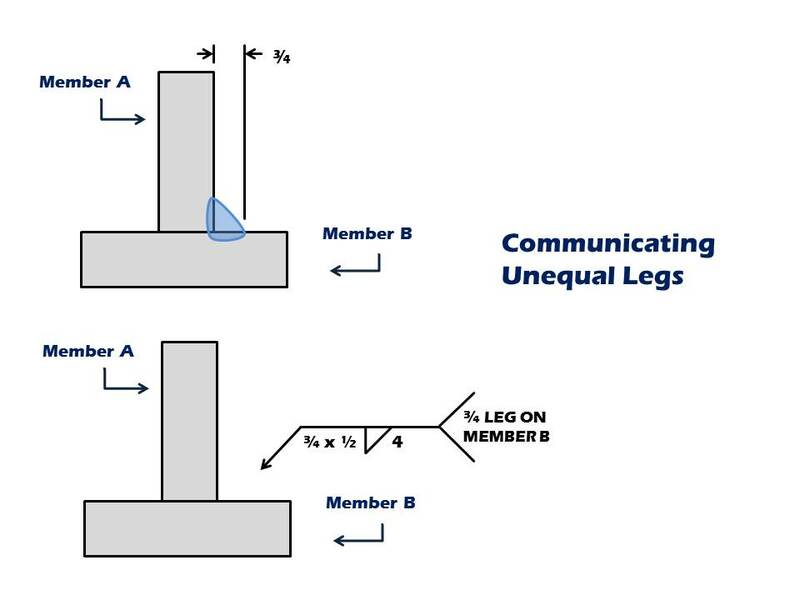 When working with unequal leg lengths, the joint members must be labelled as “Member A” and “Member B” respectively. Unequal legs can then be assigned to a member using two different methods. This detail is either written in a note in the tail of the welding symbol or conveyed through the use of dimension lines. The tail is attached to the end of the reference line. 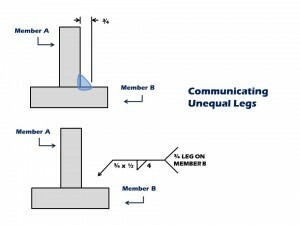 Within it, a note should be written stating “3/8 leg on Member A” or “5/8 leg on Member A” in order to communicate which member gets a given leg dimension. Since the note assigns one dimension to a specific member, we know that the other dimension belongs to the remaining member by default. As we mentioned, this can also be accomplished through the use of dimension lines. 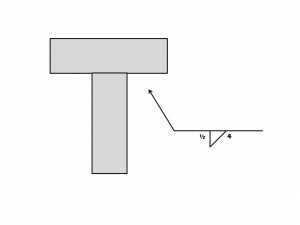 Dimension lines are two parallel lines placed around a given weld leg. These lines are flanked by an arrow outside of each line. The size of a weld leg is written outside of or within these lines. Again, on a plan, only one dimension needs to be indicated in the drawing in order to assign a leg size to a particular member, because as long as you know where one leg dimension goes, the other dimension applies to the remaining leg. If you have access to AWS A2.4: 2012, an example of each of these can be found in section 8.2.2 on page 52. Hope I was of some help! If you have any further questions, please feel free to contact us again. Thanks again for commenting!